May 23, 2017. 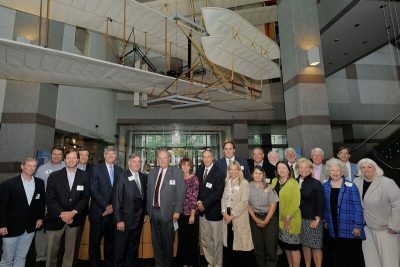 The North Carolina Museum of History is the perfect partner for the care and display of the 1903 Wright Flyer during the renovations of the visitor center at the Wright Brothers National Memorial. As the visitor center is closed (November 2016-fall 2018) for a major rehabilitation, all exhibits and artifacts have been relocated and stored. The reproduction glider and plane require a considerable amount of space and temperature control conditions. Several entities were proposed to house/store the 1902 Wright Glider and 1903 Wright Flyer but the Foundation believed strongly that these Wright machines remain in North Carolina. 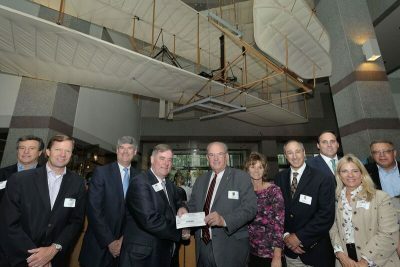 The First Flight Foundation presented to the North Carolina Museum of History Foundation a donation of $31,000 to install and exhibit the 1903 Wright Flyer in the museum’s lobby. The 1903 Flyer hangs 12 feet, the height of the first flight. This project was a collaboration of the two foundations and the National Park Service-Outer Banks Group. The 1902 Wright Glider is currently being refurbished by the NPS-Harper Ferry Interpretive Division. It is slated to be installed later this year at the NC Museum of History. For this project, the two reproduction Wright machines are on loan from the National Park Service to the NC Museum of History. Upon the reopening of the WBNM visitor Center, the 1903 Wright Flyer will return as a feature artifact in a new exhibit in the visitor center’s flight room. The 1902 Wright Glider will remain at the museum on extended loan.